Town of Groveland was established in April, 1813. 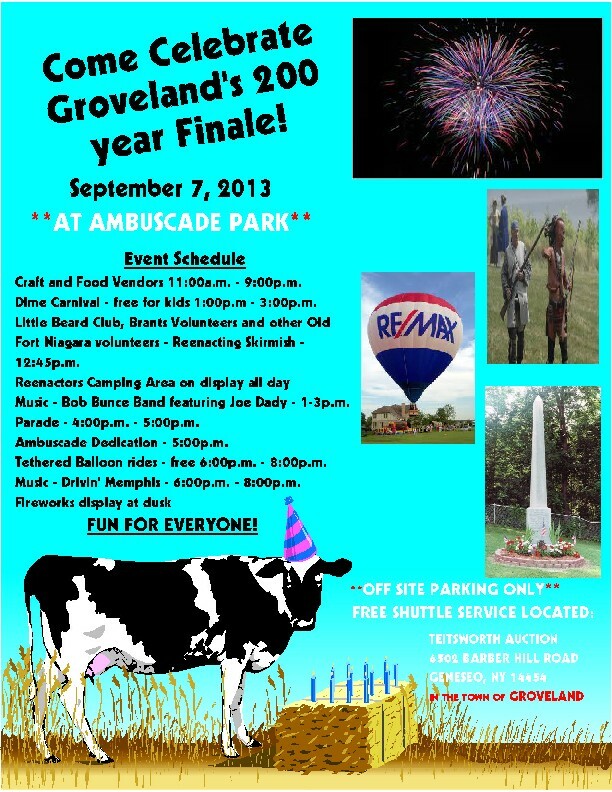 Groveland History: Groveland is the hometown of Astronaut James Adamson, who completed two trips to outer space. Groveland is the site of the only battle of the Revolutionary War in Western New York. Hampton Corners in Groveland was the home of James Wadsworth, Jr. who was a Senator and Congressman of the U.S. for nearly 30 years (1900 - 1930). Elizabeth Smith Miller was born at Hampton Corners, and was the designer and wearer of bloomer (pants) in the women's lib movement. Groveland is now the largest underground salt mine in the northeastern United States started in 1998. James Buinery is buried in Williams Cemetery, he ran for president if the U.S. twice in 1840 & 1844.